Twenty-three workers have been killed and 12 others injured in trench collapses so far in 2016 – an alarming increase from the previous year. "There is no excuse," said Dr. David Michaels, OSHA assistant secretary. 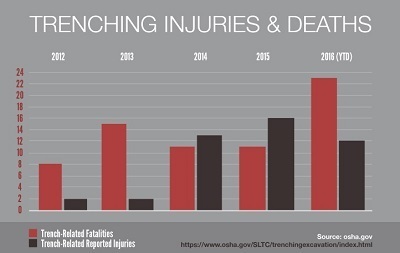 "These fatalities are completely preventable by complying with OSHA standards that every construction contractor should know." OSHA's trenching standards require protective systems on trenches deeper than 5 feet, with soil and other materials kept at least two feet from the edge of trench. OSHA has a national emphasis program on trenching and excavations with the goal of increasing hazard awareness and employer compliance with safety standards. For more information, read thenews release.